Depart from your Playa del Carmen hotel in a comfortable, air-conditioned minivan to begin your exciting excursion. Feel your heart rate quicken as you approach the park and prepare for a variety of adventurous activities. Enter the park and make a beeline for the two white-knuckle zip line circuits that dominate the treetops; gaze in wonder at the 2-mile (3.8km) track that contains 14 cables and several suspension bridges before suiting up and soaring over forests and down into subterranean caves. Glide through the alternative circuit to splash into a refreshing cenote at the end of your ride. Explore the atmospheric rainforest whilst driving your own personal amphibious vehicle; drive past fascinating flora and fauna and traverse rocky rivers during your voyage into the heart of the jungle. 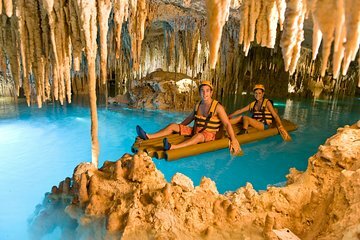 Next, submerge yourself in the subterranean network of grottoes and caves; using your hands as paddles, float past dramatic stalactites and stalagmites on a gentle journey through mysterious cave chambers. Refresh with a dip in the inviting waters before re-emerging into the sunlight for some savory satisfaction. Dry off in the park’s excellent facilities then venture to the restaurant to enjoy the local and international specialties of the buffet lunch. Finish your plate of fresh and flavorsome food before returning to the minivan for the journey back to your Playa del Carmen hotel. Xplor park was awesome. Great experience from the beginning. A shuttle van picked us up in morning and took us to park and brought us back to our resort at end of day. Xplor park was great. No waiting and we were able to do everything. Would definitely go back. Ziplines, the swim through the Cenote, ATV rides, the food, everything was great. Love, Love, Love Xplor. Picked up at our resort on time. This was our 2nd. Visit to Xplor in 7 years and it was as wonderful as I remember. Nice changes were made. For example: the zip line was no longer one route with 14 lines but now divided into 2 routes of 7 which was more manageable. The same for the 4 X 4. Now 2 routes. Also have hammock swing ride which is new. Another difference is that you can do everything at least twice. The food was better than the resort we were staying at. No alcohol in park-only for purchase as we exited. Would pay to do again! It was a lot of fun. The ziplining was great! Some of the activities were a little too theme-parkish. I was expecting a little more natural experiences. 5 Activities - Zip Lining was the best! This place has it all! Fun for the adventure seeker. Relaxation for those who are more laid back. This was one of the top two activities of our 10 day trip. We were able to do everything at Xplor and the Amphibious vehicles and water-landing on the zip lines were a total hoot! The buffet lunch was great with something for everyone! We will definitely be back to this one! If your interested in zip lining for hours this is the adventure for you! SO fun and efficient set up! Wonderful food buffet. Juice, lemon aid, etc available free of charge. Thank you for NOT looking like a Disneyland with a charge at every turn. A - MAZE - ZING.